Late last week I gave myself a nasty paper cut, one I didn’t fully appreciate until I tried out a fancy new salt scrub. Sweet mother of god! I’ve had spinal taps that were less painful! I was certain I’d be nursing my grievous wound for weeks, so was pleasantly surprised when the band-aid fell off in the shower yesterday morning, revealing a perfectly healed finger. Amazing! There was a time when I thought the only miracle my body was capable of, was worthy of, was creating, carrying, birthing, and nurturing a child. Now that that ship has sailed, I’ve become more aware of the miracles it performs every day. It swims, it runs, it carries 60 lb. dogs and bags of groceries up stairs. It breathes, it whistles, it sings! It turns brown in the sun, it blushes at the slightest flirtation, it gets splotchy when it cries, whether in sorrow or joy. Many of us have felt that our bodies have betrayed us, and we’ve beaten ourselves up for what our bodies couldn’t or wouldn’t do. With my eye on the goals of full acceptance and healing from this childless-not-by-choice journey, today I choose to celebrate, with gentleness and gratitude, this miracle that is my body. It’s the least I can do after all it’s done for me. 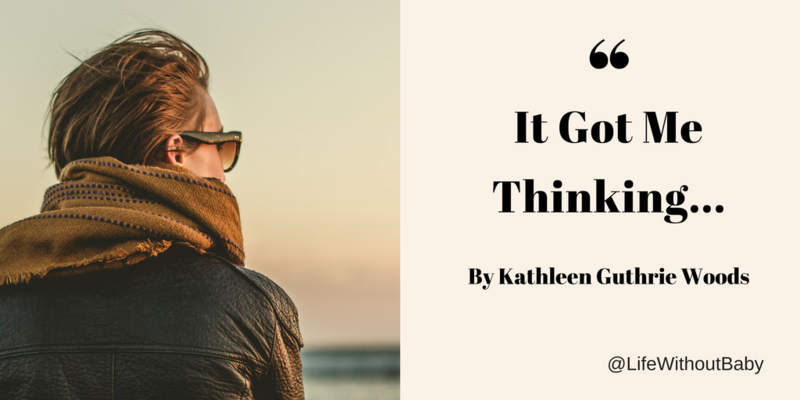 Kathleen Guthrie Woods is mostly at peace with her childfree life. This is awesome! I, too, am at a point where I am trying to love every part of myself–“imperfections” and all. God created us beautifully and perfectly. We must remember that! Thanks for the reminder. I’m in perimenopause, so the hormone fluctuations and very heavy, periods are quite difficult. This post made me teary eyed. Thank you Kathleen. This reminds me to remember that my body still works perfectly fine and is pretty strong .. it functions well despite not producing a baby .. but why should i focus on that one thing? i still have my health, and i am able to do everything else .. many people many not even have the basics around the world .. but i am Thankful for what I have. Thanks for this post honoring gratitude. Even if a body fails at something, why blame it? It does its best! If someone fails at something and blames him- or herself, we comfort and support that person, right? Why not ourselves? But I do the same, the difference is that my body feels betrayed by the me that failed forming a partnership that could have been my opportunity of trying to become a parent. So I have been depressed and felt unattractive and useless and to comfort myself I ate and became overweight, which my body felt betrayed by too. I worked too hard, trying to feel as if I was worth something through work. Now, I’m still overweight, but it’s better. In in ok shape. I exercise. My brain has recovered from the depression and nearly from the exhaustion. I’m never going to blame myself again, for the bad luck of not finding a partner or for the decision of not trying on my own. I’m grateful everyday for the health of my body and of my amazing brain that recovered from so much and still want to experience and learn and live this life that is mine. You sound like a very strong woman with an excellent outlook! You are right. Things happen in life that are out of our control, and we shouldn’t blame ourselves for that. Oh, gosh, Lin, what a journey you’ve been on. I celebrate your recovery of mind, body, and spirit. Hugs to you! Hear hear Irene, after years of punishing myself and my body for not performing (having a baby) it is high time to celebrate and be grateful for my body and what it can do. Thanks Kathleen too for another excellent article. *Cheers* yes indeed, We have accomplished Many things in life! Yes, we did !! And The Best Is Yet To Come!!!! Fertility problems and pregnancy loss made me realize how amazing it is that most babies are born healthy. I think I appreciate the miracle of a healthy baby far better than any parent who hasn’t suffered IF or PL, who just takes it for granted! Same here. But they take so much for granted. I totally agree. I think that’s where a lot of the thoughtless comments come from.